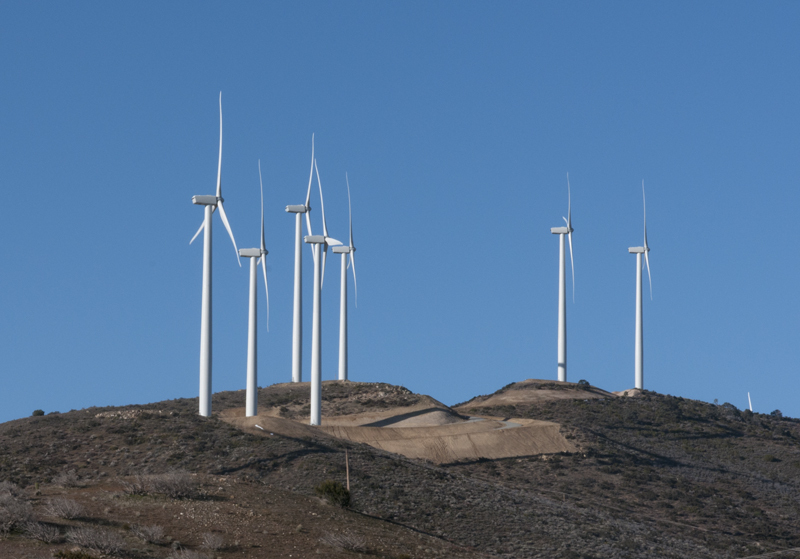 The build-out of the Alta Wind project in California will take a number of years, but the Balfour Wind Energy Constructors' joint venture recently completed the 150 MW first phase of the project. Along the way to completion, they ran into snow, heavy rains, forest fires—everything, it seems, except locusts. When it comes to wind power projects in the U.S., there's big—and then there's extraordinarily big. Easily falling into the second category is the Alta Wind Energy Center in California's Mojave Desert. Alta Wind will be the country's largest wind power project—it's expected the project will generate up to 1,500 megawatts of renewable energy. That represents enough power to sustain the electricity needs of 1.1 million people or the equivalent of 275,000 California homes. The project is being built adjacent to existing older wind projects between the towns of Mojave and Tehachapi, about 100 miles north of Los Angeles. 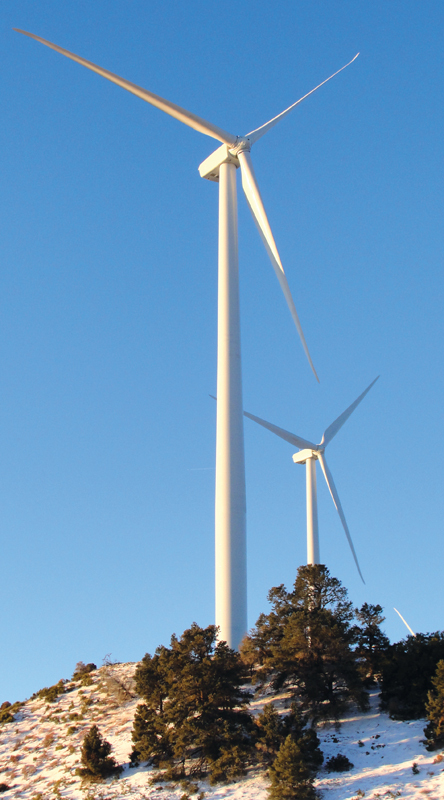 The Alta Wind project is owned by California Highwind Power, a subsidiary of Terra-Gen Power. With more than 1,550 MWs of generating capacity across 26 renewable power facilities, the company is one of the leading renewable energy providers in the U.S. Terra-Gen is said to be the only American company that provides electricity on a utility scale from three major renewable energy sources: wind, solar, and geothermal power. The build-out of Alta Wind will take a number of years, but the Balfour Wind Energy Constructors' (BWEC) joint venture recently completed Phase 1 of the project. Along the way to completion, they ran into snow, heavy rains, forest fires—everything, it seems, except locusts. And it's up there, in terms of elevation. The Alta Wind Energy Center site is located in the foothills of the Tehachapi Mountains, with altitudes ranging from 3,000 to 6,000 feet. Despite the challenging conditions, high elevation site, and an aggressive schedule, the project was delivered on schedule and on budget, to meet the requirements of delivering power to utility Southern California Edison. BWEC is a joint venture between Texas-based Balfour Beatty Construction and Oklahoma-based Wind Energy Constructors. Balfour Beatty Construction is one of the largest commercial contractors in the U.S., and Wind Energy Constructors is one of the most experienced wind farm construction companies in the country. The Mojave Desert site is familiar territory to Wind Energy Constructors. The company has been involved in almost every single project in the Tehachapi/Mojave wind corridor. In addition to weather and geographical challenges, the project also had to deal with a great deal of environmental permitting, which in itself had an impact. 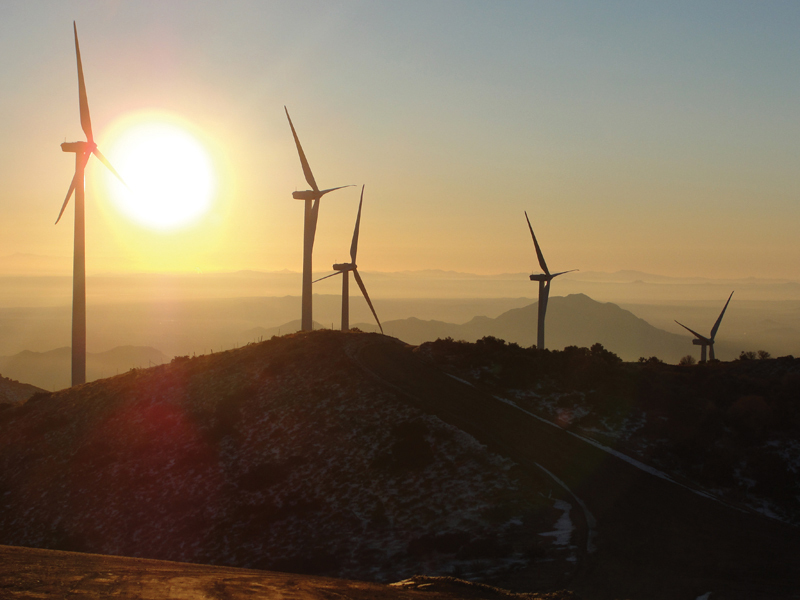 Due to environmental issues, BWEC received Notice to Proceed with Alta Wind 1 some eight months after the company was awarded the contract to build the project. "Permitting issues affected the project right through to its mid-point," said Kirk Tracey, project director. "For example, once we started construction, a near-extinct plant, the Bakersfield Cactus, was discovered. The owner diligently worked on dealing with that while we diligently worked with them on moving around the construction work sequence to accommodate the situation." An indigenous plant, the Bakersfield Cactus was not known to grow above 3,000 feet; however, it was found on the site. For its part, BWEC had to document the locations and numbers to obtain permits to remove and relocate the plants. This required multiple permits for upwards of 300 cactus plants. An environmental subcontractor is also responsible for ensuring that the cacti stay alive for several years. The Mojave Desert Tortoise is not protected everywhere but is listed as a protected species in this area of California because of its low numbers. BWEC was required to install tortoise fencing in all work areas. A biologist specializing in the tortoise had to survey each work area. If one of the tortoises was found, the biologist was the only one who could move it. The project team was required to look under vehicles before moving them to make sure that there were no tortoises, and if a gate was left open to any of the work areas, the biologist had to resurvey the area. Depending on which part of the site they were working on, there were different sets of zoning. At one point, BEWC prepared a map showing that there were seven different zoning date requirements. The zoning went from the oldest, with little requirements, to the most recent zoning, which had close to 100 zoning or environmental impact restrictions. "It impacted what we did," says Tracey. "But in order to meet the spirit of all the zoning regulations, we basically took a blanket approach. We treated each zone as if it had all the restrictions as the most recently zoned areas." Navigating the roads during construction of the Alta Wind project could be an adventure, with grades up to 20 percent. BWEC employed special equipment, such as power haulers and graders as assist vehicles, to get wind turbine components to the high elevation sites. There was a very conscious effort to go beyond the environmental regulations, which resulted in BEWC not receiving a single citation or even a request for a remedy from any of the seven state and federal government agencies involved. Whenever a representative of an agency toured the site, a BEWC employee would show them the detail and vigor they applied to meeting the regulations. "It's typical of all of our jobs," says Tracey. "We embrace the government agencies and kind of make them part of our team, especially OSHA." The site has five different landowners: CalPortland, Oak Creek Energy System, GE, Terra-Gen Power, and the Bureau of Land Management. Oak Creek is an existing wind farm with active turbines and existing utilities. Close coordination was required with the property owners, especially Oak Creek, to identify and relocate the utilities. This required obtaining permits with the gas companies, county road department, telephone, and gas pipelines and also permitting for overhead utilities. The Pacific Crest Trail, a hiking trail from Mexico to Canada, is a public-use trail that crossed the site. A portion of the trail was relocated to preserve accessibility. Since permitting was at different stages for different parts of Alta Wind 1, it was a bit of a juggling act to keep the project moving forward and keep construction equipment and crews busy. "There was definitely a lot of re-sequencing involved, depending on which permits were available," said Mark Bradley, director of preconstruction for BWEC. "We built a wind project in New Mexico, where we got on top of a mesa and built a long string of wind turbines. This was definitely not one long string. We divided the project up into different zones—Top West, North, Reflector Hill, Oak Ridge. The smallest of those zones had three turbines and the largest had 20 turbines. "So when a zone was found to have Bakersfield Cactus or there was another environmental matter to deal with, that zone would be put off to the side, and we would move work to the zones that were permitted. It was not the most efficient method—we had to move equipment in and out of some areas several times. But it was a team effort with the project owners, Terra-Gen," said Bradley. Helping out was the fact that turbine supplier GE had already delivered the 100 1.5 MW turbines, and they were stored off site, allowing BEWC to control the delivery of the turbines to the site itself. Planning and communication are keys to any successful wind power project—but even more so with Alta Wind, says Tracey. "We needed that with shifting equipment and people around—especially when you are in locations with very small crane pads, such as what we had. The road would come in and run to a very small pad. You couldn't pre-stage your tower components, so you are really doing just-in-time delivery." All the towers were delivered by rear steerable equipment. Once a delivery was made, the equipment could just be driven back off the hill without turning around. Just navigating the roads could be an adventure, with grades up to 20 percent. They employed special equipment, such as power haulers and graders as assist vehicles, to get turbine components to the sites. There was some access road built in the 1980s when Oak Creek was developed with less powerful wind turbines. But it could not accommodate the larger, modern turbines. "So we had to improve all those roads," said Tracey. "And to get up the major grades, well, that involved all new road construction." They used a GPS mapping system, which generated 3D drawings. AutoCAD Civil 3D software was utilized for civil engineering. BWEC used this software for surveying, surface and grading analysis, earthwork calculations, criteria-based geometric design, and automated machine guidance. The mapping and drawing data were loaded directly on to the construction equipment. The turbines are connected to Southern California Edison via six miles of 230kv transmission line. BEWC and its joint venture partners are accustomed to wild weather when building wind power projects, but Alta Wind had its share of big time weather. The fact that they had snow was not too much of a surprise, considering the high elevation. Elevation varied on the site itself, from 4,000 feet to above 6,500 feet. They had a month of high wind that impacted crane and erection work. "The biggest thing we had, though, was a 100-year storm," says Tracey. "In one week, we received 10 inches of rain—that exceeded the amount of rainfall that area gets in an entire year." The ground could not accommodate that amount of rainfall, so they had to immediately start a remediation effort, with seeding. "We also had 25 days with temperatures over 100 degrees and a late season snow/sleet storm with 50 mph winds," added Bradley. "The only thing we didn't seem to get was locusts." One benefit of building in the Tehachapi area is that major centers are close, and there is a legacy wind industry support infrastructure. "The Tehachapi has been built around the wind industry in the past, so it is geared up to support that industry. Tehachapi, which is a good-sized town, is close and Bakersfield was only slightly farther. We had major freeways going in there." After the Alta Wind project, BEWC started work on a wind farm in rural Kansas, and the logistics of getting material there is significantly greater. While BEWC has worked on a large number of wind projects, Alta Wind once again confirmed the benefits of the joint venture company. "What Wind Energy Constructors brings is a wealth of knowledge of not only the technical aspects of wind turbines, but also the clients, the trades side, and the people who have the expertise," says Bradley. "What Balfour Beatty Construction brings to the table is the financial strength for bonding, their risk management programs, and the ability to manage large, complex projects. You put the two entities together, and what we've seen is that we're clearly stronger as a joint venture and are able to compete against the other major players whereas individually, we probably could not compete." It enables them to tackle tough projects, such as Alta Wind. "We had a lot to deal with on that part of the project, the hills, the grades, and the difficult constructability issues. The rest of the Alta Wind project is down on the desert floor. It's flat, you have nice soil to work with, you do not have the issues that we had to deal with. "But then we look at ourselves as a company that comes in and handles the difficult projects—we're not a cookie cutter project company," added Tracey. They take pride in being flexible and being able to change gears as required—having not only Plan B in their back pocket, but plans C, D, E and further through the alphabet. "We put together a plan and that's great when it works—but we have the flexibility to do the alternatives. The Alta Wind project showed our ability to take a well-honed plan, make changes on the fly, keep it moving, and make the owner's completion date," says Tracey. As the EPC contractor on Alta Wind 1, BWEC worked hard to communicate with landowners and other interested parties on the timing and progress of the project. "Terra-Gen had already engaged the community in communications," said Tracey. "They got people on board to get the permit, and they had community support in the nearby community of West Ranch—but I think the support of the West Ranch Community was reinforced with the forest fire." The area was hit with a major forest fire in July 2010. Most local residents were evacuated early on in the fire. BWEC employees assisted the firefighters, providing fuel for the fire trucks, and filling the water pools that the helicopters were pulling water from for water drops on houses. After the fire, local newspapers ran stories of area residents going up to the trades people on the project, to personally thank them for saving their house or a friend's house. "They saw how the wind project owners and the contractors involved with the project were there not just to develop and build the project—but also to be good neighbors," said Bradley. Forest fires are not usually one of the challenges you run into in wind farm construction, Tracey added. "I have not been involved in a project with this many challenges in a while," he said. "Usually you will have one difficult aspect to a project—terrain, isolation, or weather. But the challenges on this job just kept coming. But that was OK, these are the ones you remember. You don't remember the easy jobs—you remember the hard jobs."